Rick Moody is the author of numerous novels, collections of short fiction, a memoir, and a book of essays. His debut novel, Garden State (1992), was the winner of the 1991 Editor’s Choice Award from the Pushcart Press. The Ice Storm (1994) was published in twenty countries and released by Fox Searchlight as a film directed by Ang Lee in 1997. Other novels include The Four Fingers of Death (Little, Brown & Co., 2011); The Diviners (2005); and Purple America (1997), for which foreign editions have appeared widely. Right Livelihoods, a book of three novellas, was published in 2007. A novel entitled Hotels of North America is forthcoming in October 2015. His collections of short fiction include The Ring of Brightest Angels Around Heaven (Little, Brown & Co., 1995), the title story of which was the winner of the 1994 Aga Khan Award from The Paris Review, and Demonology (2001), which was also published in Spain, France, Brazil, Germany, Holland, Portugal, Italy, the United Kingdom, and elsewhere. The Black Veil: A Memoir with Digressions (Little, Brown & Co., 2001) was a winner of the NAMI/Ken Book Award, and the PEN Martha Albrand prize for excellence in the memoir. His book-length collection of essays, On Celestial Music, was published by Back Bay Books in 2012. An anthology, edited with Darcey Steinke, Joyful Noise: The New Testament Revisited, appeared in November 1997. Moody’s short fiction and journalism have been anthologized in Best American Stories 2001, Best American Essays 2004, Year’s Best Science Fiction #9, and in the Pushcart Prize Anthology. Moody is the recipient of the Addison Metcalf Award from the American Academy of Arts and Letters and a Guggenheim fellowship. His radio pieces have appeared on The Next Big Thing and at the Third Coast International Audio Festival. Also a musician, his album Rick Moody and One Ring Zero was released in 2004, and was followed by three albums by The Wingdale Community Singers, a solo album, The Darkness Is Good, and a forthcoming spoken word/noise/jazz album entitled The Unspeakable Practices. Moody is a member of the board of the Corporation of Yaddo. He is a former secretary of the PEN American Center, and he co-founded the Young Lions Book Award at the New York Public Library. He teaches at Yale University and New York University. Rick Moody was born in New York City. He attended Brown and Columbia Universities. He lives in Astoria, New York, with his wife, the artist Laurel Nakadate. Reginald Edward Morse is one of the top reviewers on RateYourLodging.com, where his many reviews reveal more than just details of hotels around the globe–they tell his life story. The puzzle of Reginald’s life comes together through reviews that comment upon his motivational speaking career, the dissolution of his marriage, the separation from his beloved daughter, and his devotion to an amour known only as “K.” But when Reginald disappears, we are left with the fragments of a life–or at least the life he has carefully constructed–which writer Rick Moody must make sense of. 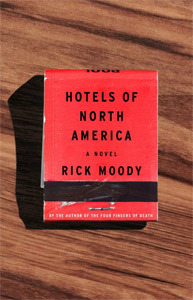 An inventive blurring of the lines between the real and the fabricated, Hotels of North Americademonstrates Moody’s mastery ability to push the bounds of the novel. Rick Moody has been writing about music as long as he has been writing, and On Celestial Music provides an ample selection from that effort. His anatomy of the word “cool” reminds us that, in the postwar 40s, it was infused with the feeling of jazz music but is now merely a synonym for neat, “a grunt of assent.” “On Celestial Music,” which was included in Best American Essays 2008, begins with a lament for the loss in current music of the vulnerability expressed by Otis Redding’s masterpiece, “Try a Little Tenderness”; moves on to Moody’s infatuation with the ecstatic music of the Velvet Underground; and ends with an appreciation of Arvo Part and Purcell, close as they are to nature, praise, “the music of the spheres.” Modern groups covered include The Magnetic Fields (their love songs); Wilco (the band’s and Jeff Tweedy’s evolution); Danielson Famile (an evangelical rock band); The Pogues (Shane McGowan’s problems with addiction); The Lounge Lizards (John Lurie’s brilliance); and Meredith Monk, who once recorded a song inspired by Rick Moody’s story “Boys.” Always both incisive and personable, these pieces give us inspiration to dive deeply into the music that enhances our lives and introduce us to wonderful sounds we may not know. Montese Crandall is a downtrodden writer whose rare collection of baseball cards won’t sustain him, financially or emotionally, through the grave illness of his wife. Luckily, he wins a job to write a novelization of the 2025 remake of a 1963 horror movie, “The Crawling Hand.” He tells therein of the United States’s long-awaited manned mission to Mars. Of the nine intrepid astronauts, only a lonely human arm (missing its middle finger) returns to earth, crash landing in the Arizona desert. The arm may hold the secret to reanimation or may simply be an infectious killing machine. It crawls through a civilization at its breaking point, economically and culturally—a dystopia of lowlife and laughable alternative lifestyles. The Four Fingers of Death proves again why Rick Moody has been called, “one of the most prodigiously talented writers in America” (The Wall Street Journal). Right Livelihoods begins with a cataclysmic vision of New York City after the leveling of 50 square blocks of Manhattan. Four million have died. Albertine, the “street name for the buzz of a lifetime,” is a mind-altering drug that sets “The Albertine Notes” in motion. The collection’s second novella, “K & K,” concerns a lonely young office manager at an insurance agency, where the office suggestion box is yielding unpleasant messages that escalate to a scary pitch. Ellie Knight-Cameron’s responses to these random diatribes illuminate the toll that a lack of self-awareness can take. At the center of “The Omega Force” is a buffoonish former government official in rocky recovery. Dr. “Jamie” Van Deusen is determined to protect his habitat—its golf courses (and Bloody Marys), pizza places (and beers) from “dark-complected” foreign nationals. His patriotism and wild imagination are mainly fueled by a fall off the wagon. Only Rick Moody could lead us to feel affection for this man and the other misguided, earnestly striving characters in this alternately unsettling, warm trio of stories. The light that illuminates the world begins in Los Angeles. Begins in darkness, begins in the mountains, begins in empty landscapes, in doubt and remorse. San Antonio Peak throws shadows upon a city of shadows. There are hints of human insignificance; there are nightmares. But just at the moment of intolerability there’s an eruption of spectra. It’s morning! Morning is hopeful, uncomplicated, and it scales mountaintops, as it scales all things, The light comes from nowhere fathomable, from an apparently eternal reservoir of emanations, radioactivities. Light edging over the mountaintop and across the lakes of the highlands, light across the Angeles National Forest, light rushing across skeins of smog in the California skies. Light on the Redlands, light on the planned communities, light on the guy tossing the morning newspaper from a Toyota with a hundred and ninety-three thousand miles on it. I began recording my wife’s telephone calls without her knowledge the Monday after the third weekend in April 1993. I used twin Panasonic SP-77 dual-cassette answering machine systems that were nestled on a wooden filing cabinet (cherry, with a dark finish) here in my office. There was one machine for my line and one machine for my wife’s line. They were each resting there on the filing cabinet, an antique that I bought in Chester one Sunday after we were married—during the first intoxicating month of our union. The office was, and is now, situated just down the hall from the kitchen, on the first floor. Its decorations were simple and unobtrusive and included a pair of cheap, imitation African masks and a poster for an exhibition by an artist I once met playing squash (a misty New England harbor dotted with seacraft). That morning, in my office, there was robust sunlight from two sides: north and east.